Following are key points from a paper I presented at The Museum Computer Group’s UK Museums on the Web at the Tate Modern, London on 15 November 2013. 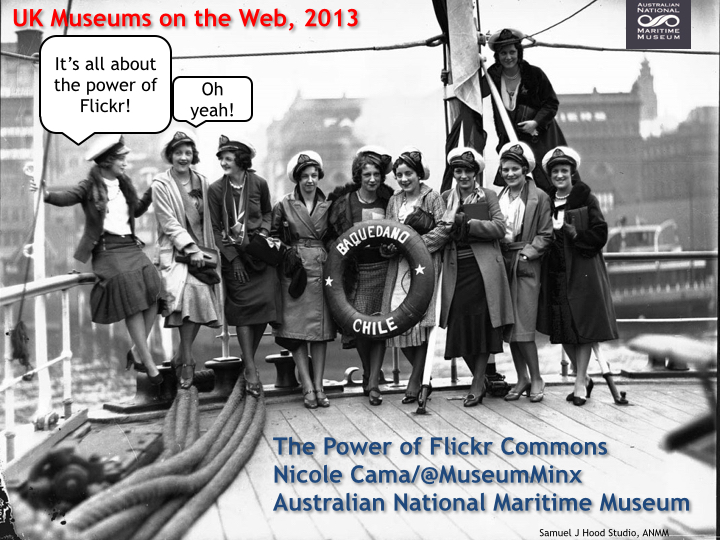 The theme of the conference was ‘Power to the People’ and I wanted to explore how one powerful online community via Flickr’s The Commons breathed new life into the Australian National Maritime Museum’s collection. 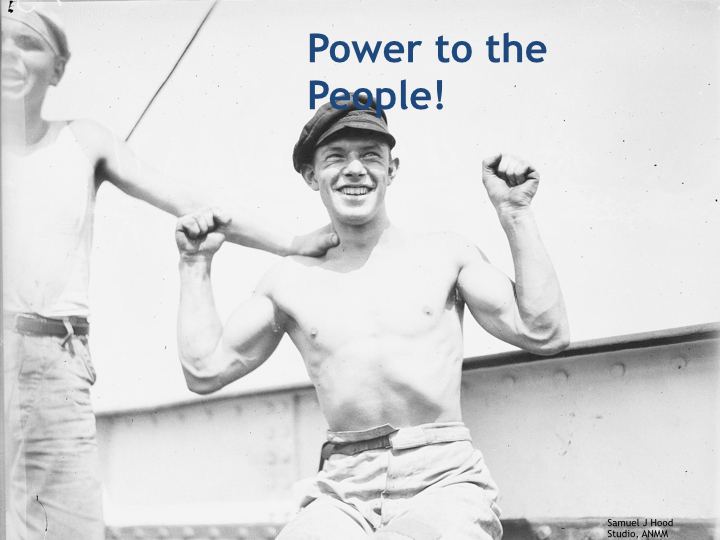 I think the theme, ‘Power to the People’ is such a compelling and exciting area for our industry to be exploring at the moment and I feel so privileged to be a part of it. 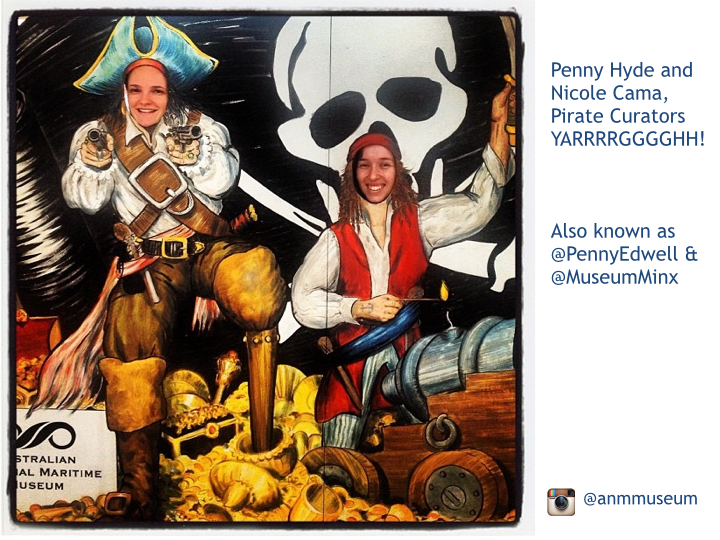 My name is Nicole Cama and I work at the Australian National Maritime Museum. This is me and my colleague Penny Hyde. Our job is to share, research, interpret and write about the museum’s collection. We both had no background in maritime history and knew zilch about boats. As we delved deeper into the rest of the collection, we found some interesting stuff. As we started to contribute more regularly, it turned out there were a number Flickr users, individuals we now call ‘super sleuths’, who took Flickr’s goals seriously. 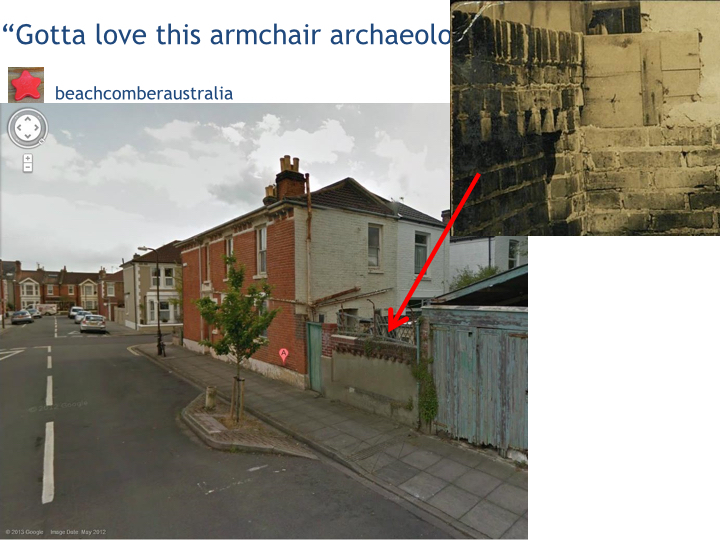 They linked it to Google street view and were able to match the brickwork of the fence to the image from our collection. Now that’s just one example of the work they do geo-tagging, but what about the more exciting stuff…what about people? 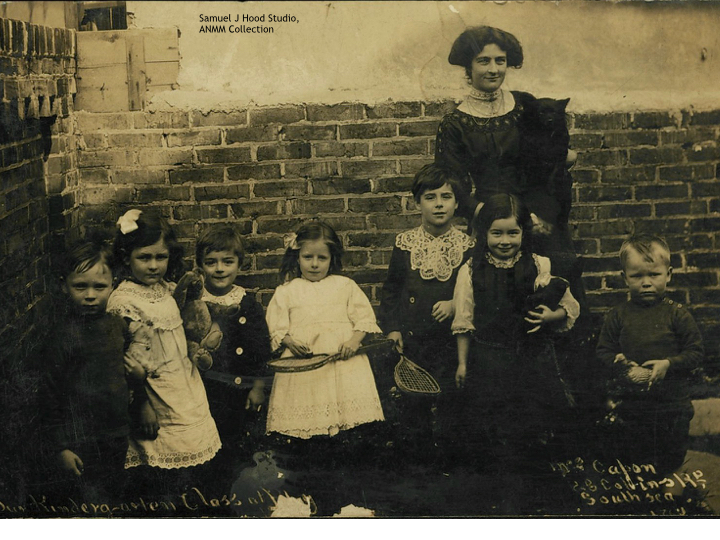 I wanted to show off what is probably my favourite photograph in the museum’s Sam Hood collection. As soon as I saw this image, I knew it was special. 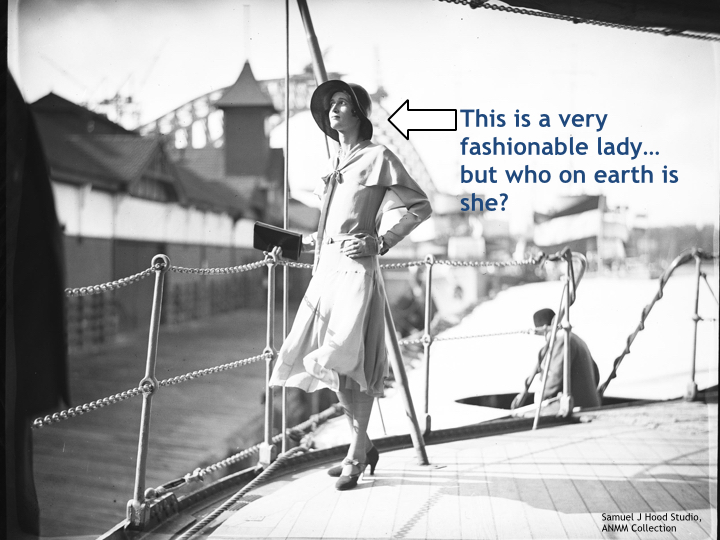 Annoyingly, I knew when, where and why the photograph was taken, but for months I had no idea who this woman was. I had put it up on Flickr, guessing her identity, knowing I was wrong but hoping one of our followers would come forward with an answer. And lo and behold, a breakthrough! 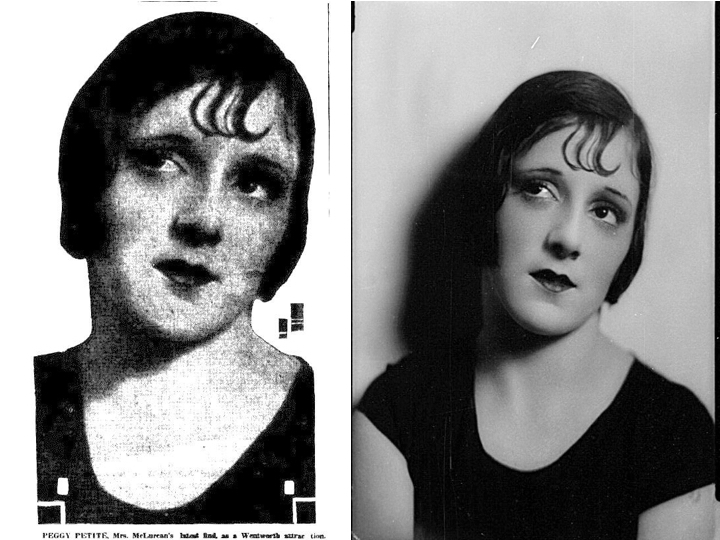 One of our followers identified the mystery lady as designer, socialite and all-round fashionista Hera Roberts. 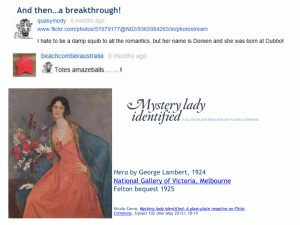 Described as an ‘uncommon beauty’ with ‘cameo-cut features’ and ‘an amazing flair for dress’, this was a story we had to publish in the museum’s magazine. What this story really demonstrated to us, was how valuable this online community is for our collection. 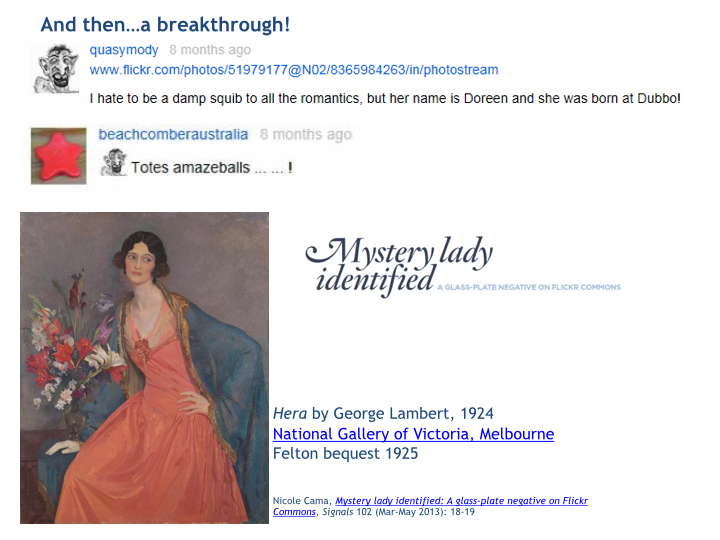 Our followers comb through the images we’ve uploaded, and update them with their own research every single day. They add layers of meaning to each photograph, revealing that there is much more to these images than first meets the eye. And it turns out, Hera wasn’t the only pretty lady to be found in our collection. And this is where we started to embrace the complete randomness of the collection. Gradually, we were shown that the museum’s collection wasn’t just about ships. 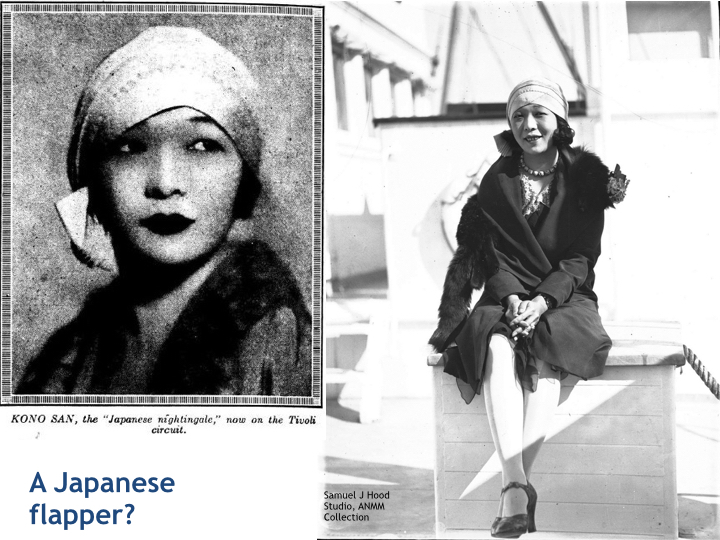 Our users found a Japanese flapper posing on a passenger liner. 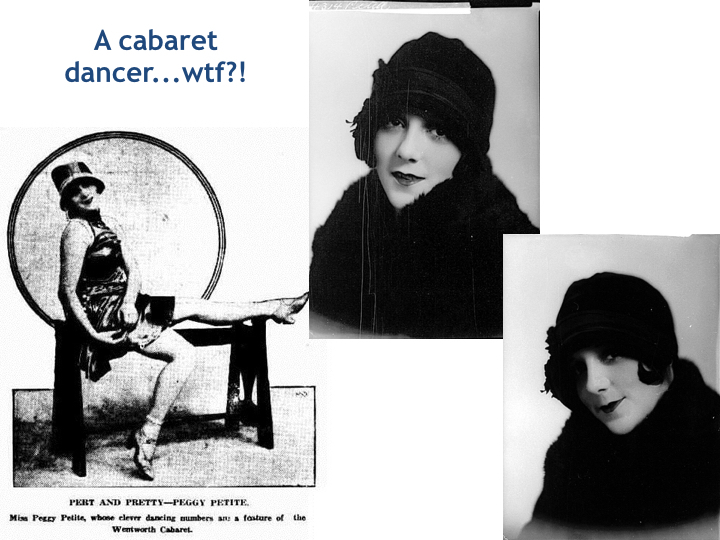 A cabaret dancer?! 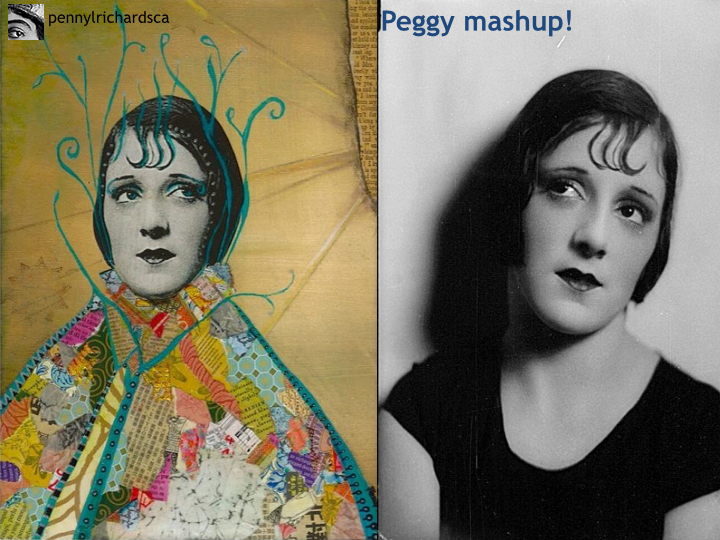 She was called Peggy Petite and our followers found the photograph from our collection in a newspaper article. Then another follower got creative and did a Peggy mashup to raise funds for the local school arts program! But this doesn’t just show how diverse our collection is, it demonstrates the importance of the National Library of Australia’s resource of digitised newspapers – I’m sure you’ve all heard of Trove. And nowhere is this clearer than in the next story. 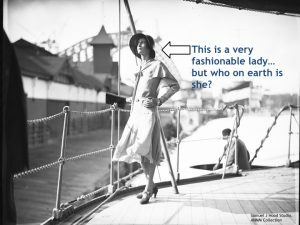 I discovered this photograph in the collection and was intrigued. 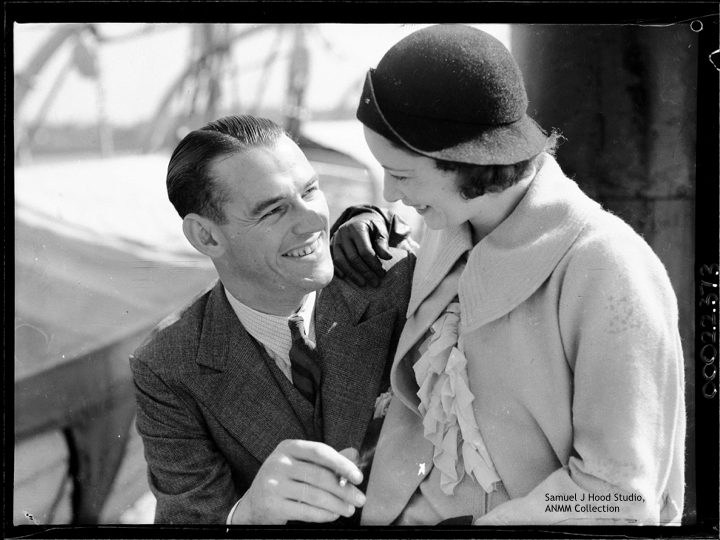 I knew what ship this photograph was taken on, but that was all I knew, so I entered those search terms and discovered this is Australian film actor Brian Abbot and his wife Grace. 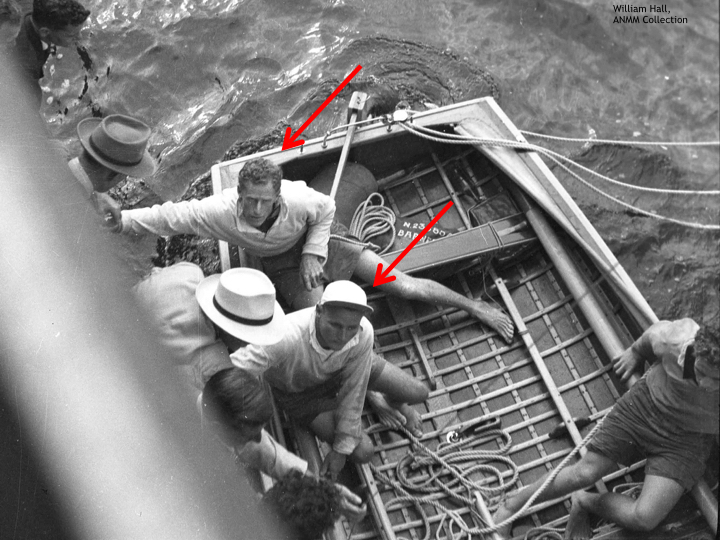 And it turns out, this, and another photograph from our collection, were the last photographs they took together, because a month after it was taken, Brian went missing attempting to cross the Tasman Sea in a motor launch. I have to say as one living in the UK I like the freedom of information you have in Australia. 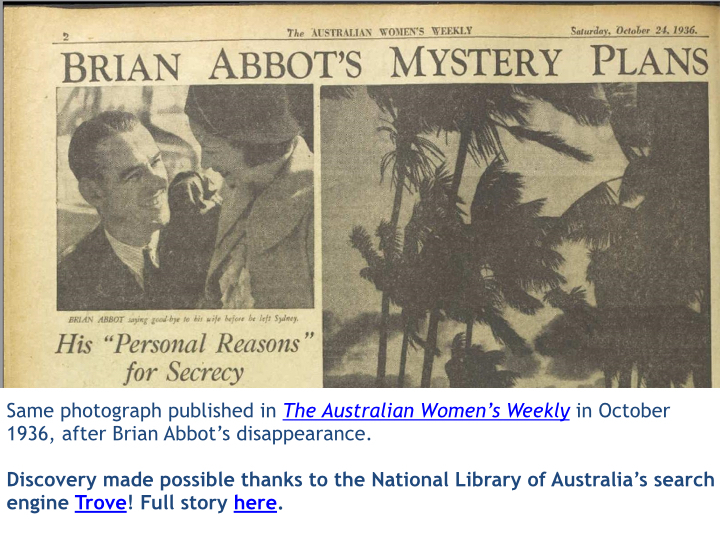 Over here every old photograph seems to be locked into some form of copyright, and it is impossible to look at old newspapers on the web without paying through a third party, so good on Trove. 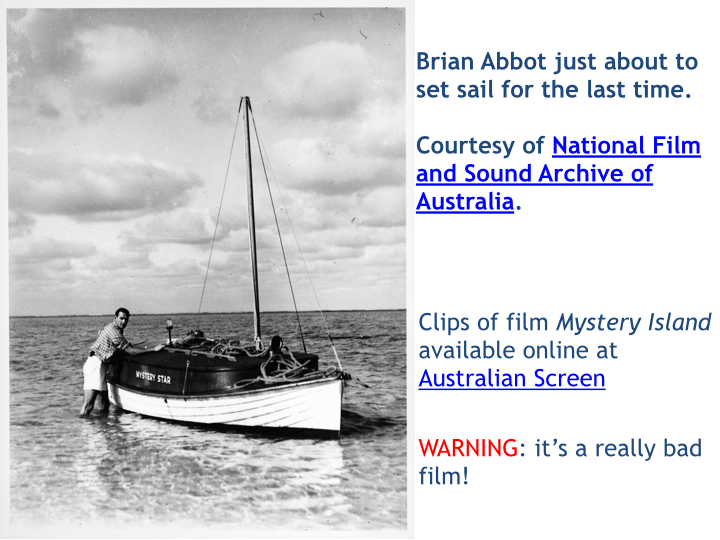 What added further meaning to this story of the ill-fated voyage across the Tasman, was discovering the collection held at the National Film and Sound Archive of Australia. 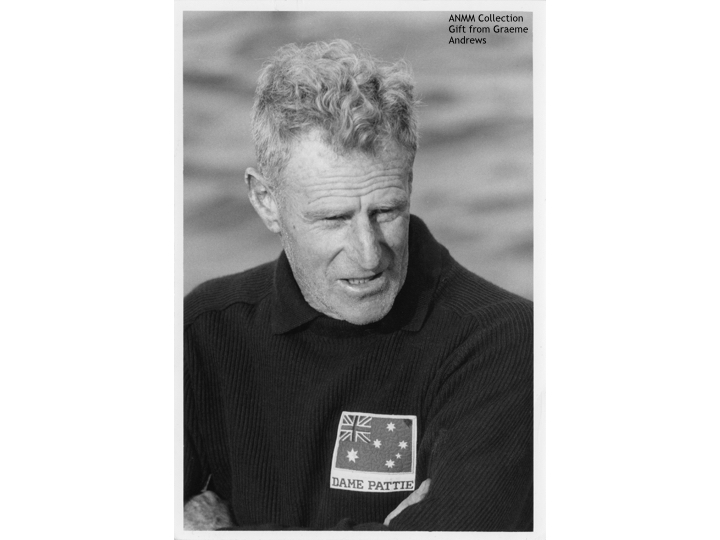 Not only did they have photographs of Brian posing next to his motor launch in Lord Howe Island lagoon, but they have the film he starred in too. My colleague Penny came across this photo in our collection depicting the champion skiff Myra Too. 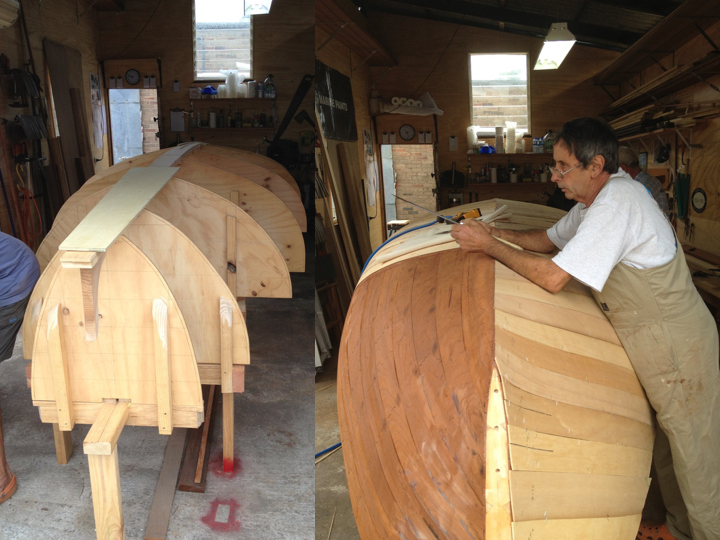 At around the same time our vessels expert, David Payne, was involved in a project to build a replica of this vessel. 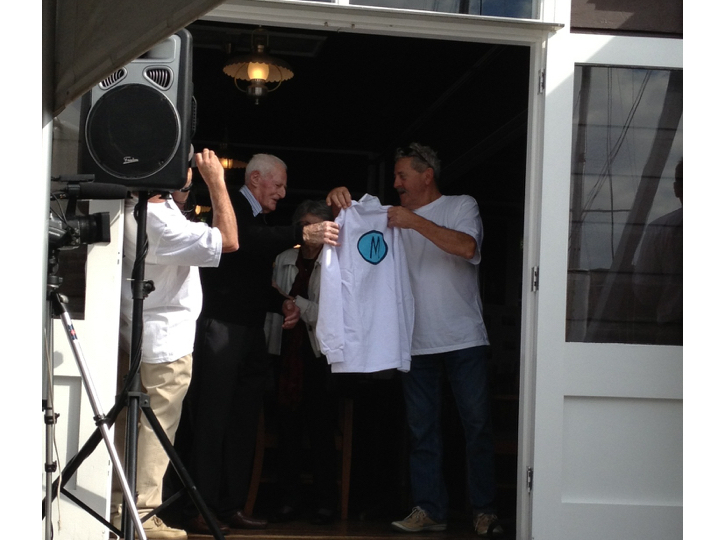 Myra Too was designed, built and skippered by this man, Bill Barnett. A legend in Sydney Harbour Bill’s built two America’s Cup challengers – but in 1951 he built Myra Too. Unfortunately in 1971 a fire in Bill’s shed destroyed the designs and models of the skiff, making David’s task of drawing designs very difficult. 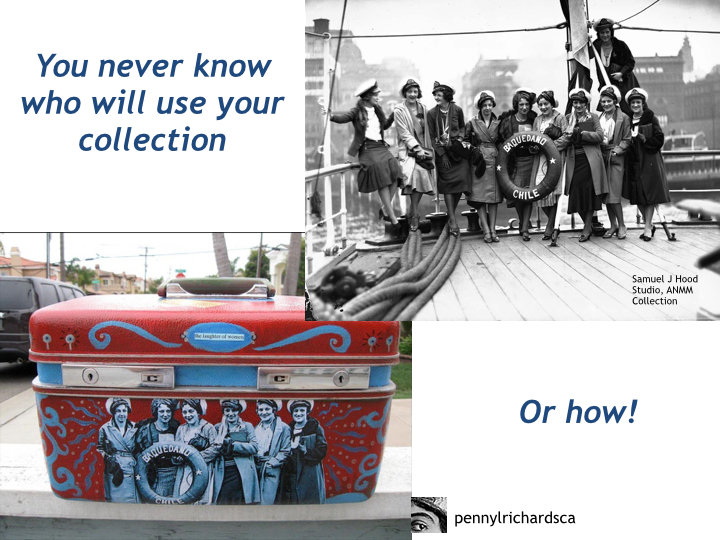 And so it was lucky Penny was able to track down our old collection photographs. And so the boat began to come back to life. Check it out, this is Bob the builder, posing as the boat was taking shape. 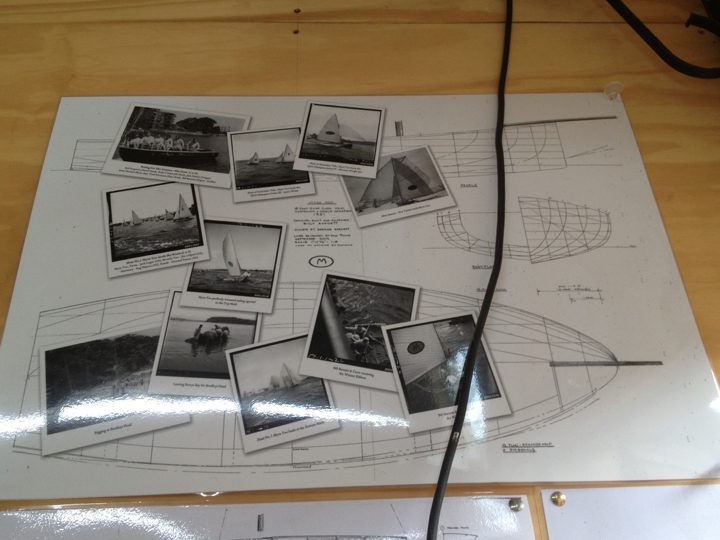 Here are the museum’s photographs hanging in Bob’s boatshed. 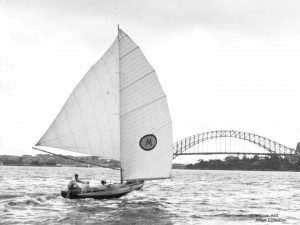 After Penny uploaded the photographs on The Commons, emails flooded in from people across Australia and even boatbuilders in the UK. Interestingly, though boaties from all over the place didn’t have an internet connection, people were printing out the images and mailing them to each other. Slowly, we realised that our initial digital engagement was turning into more face-to-face outreach with the community. 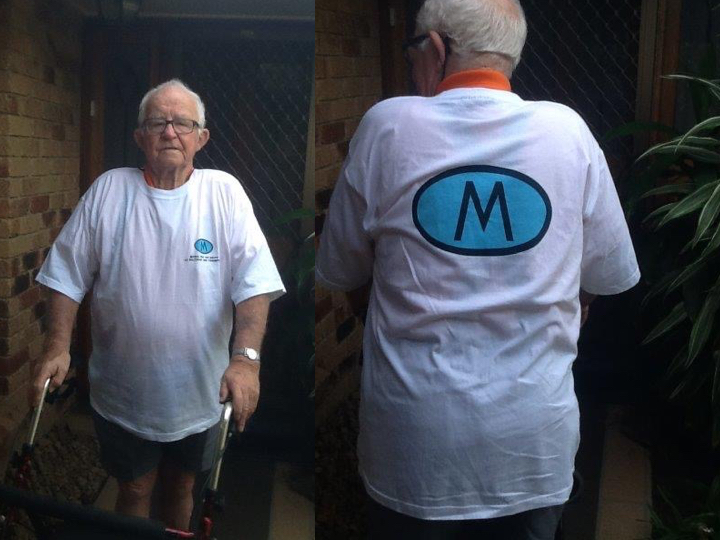 A tribute day was held in Bill Barnett’s honour, and here’s Bill, still going strong at 98 years of age receiving his Myra Too t-shirt. But the story doesn’t end there. 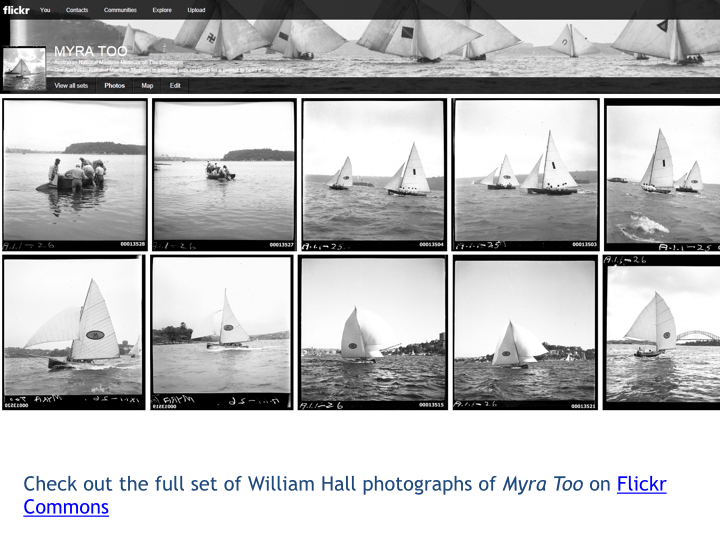 This is a photograph of Bill in Myra Too after winning a race in 1951. And this guy is Brian Stewart, who phoned in after telling Penny he “just got this google thing” and decided to search for Myra Too. 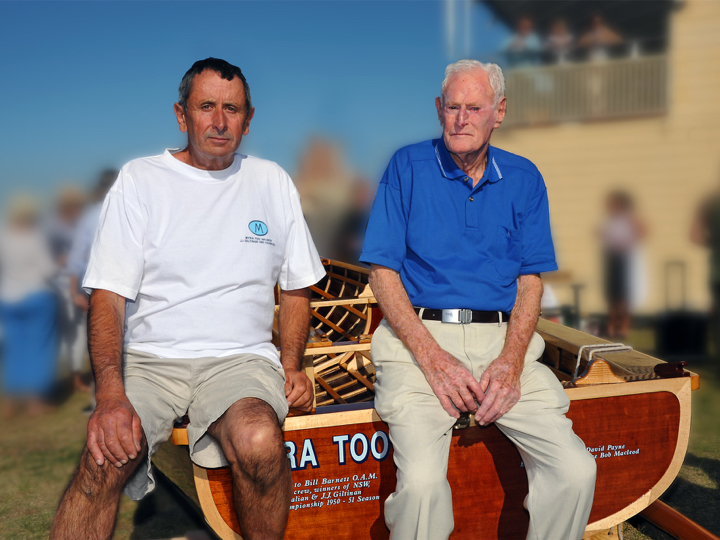 Back in 1951, Brian was Bill’s bailer boy for the team, and he’s now in his 80s living in Brisbane, Queensland. Brian now calls Penny regularly for updates and plans to fly down to Sydney to see Bill again, for the first time in 50-odd years. This is Brian in his Myra Too t-shirt, he proudly took these photos on his new iPad. And this is Bob and Bill sitting on the nearly completed Myra Too. Engagement is about designing projects that turn occasional passers-by into enthusiasts willing to go that extra mile for you. It’s is done, usually, within the safety of your institution’s building, website or social media presence. Outreach is about designing strategies that reach people wholly unknown to you and connect them with your institution. It’s done, usually, outside of the comfort zone of your institution’s building, website or social media presence. In a nutshell, in 2011 we were getting between 6 to 10,000 views per month. In September 2013 alone, we hit almost 900,000 views, averaging 30,000 views per day. 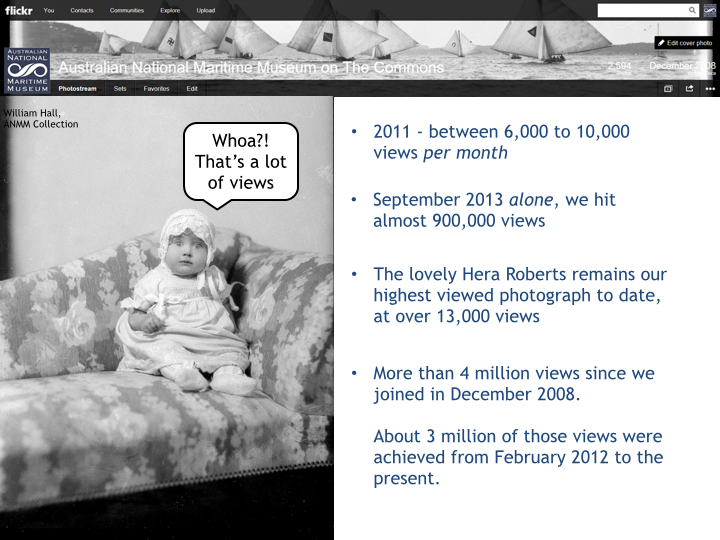 Hera Roberts is still our most popular photograph and just a couple of weeks ago we hit 4 million total views, around 3 million of which we achieved not long after Penny and I started religiously updating the feed every day. We started off as cataloguers, inputting data into to our collection database and publishing it online. But as we ploughed through, we realised that the true potential of this didn’t reside in the amount of records we were able to churn out. The value was in nurturing this online community who were willing to invest hours of their own time, researching our collection. Essentially, our followers get online every day because there’s someone on the other end to talk to. We appreciate their efforts by turning these stories into blog posts and articles, a small way to repay the endless hours they spend on our photographs. But the community is growing, the stories keep coming and the discoveries continue to amaze us as they take on a life of their own. As Bill and Bob’s story demonstrated, stories don’t just begin and end, they evolve and take on new meanings. Cultural institutions share commonalities, there are crossovers with our respective collections that we don’t always harness in a way that seriously benefits our audiences. 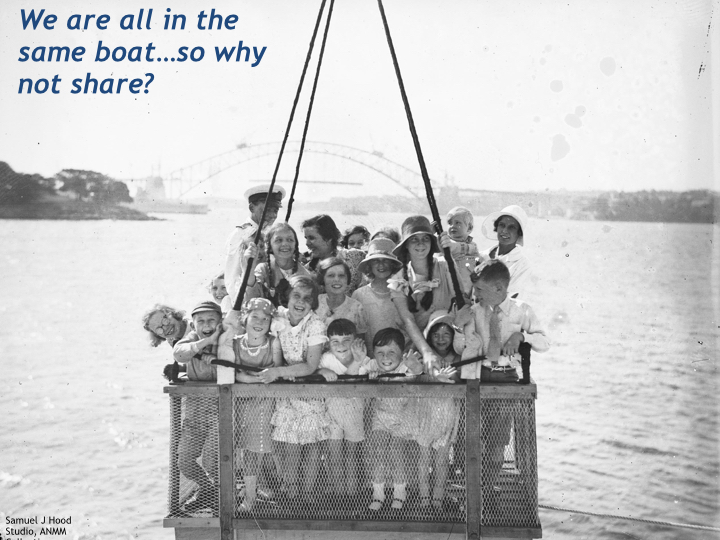 We are all in the same boat, and can achieve amazing things when we weave our collections together and make them available and discoverable online. 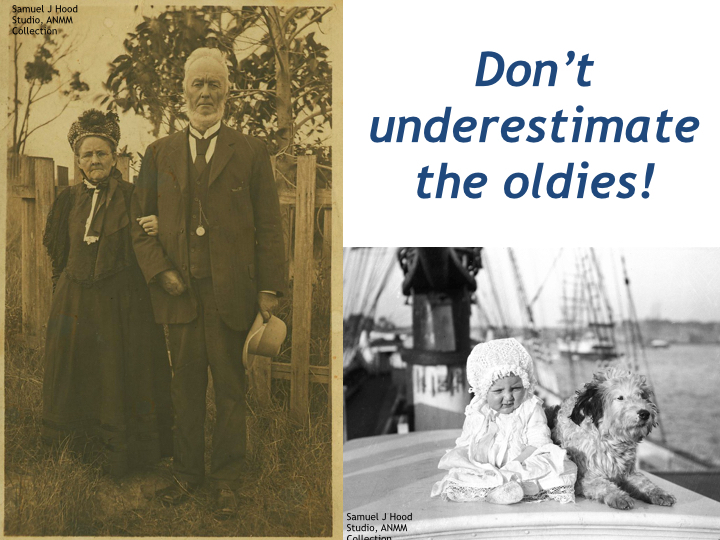 Don’t underestimate the oldies!! It’s not all about younger generations. You never know who is going to find use for your collection or in fact how they will use it. And finally, contributors online are pushing the bounds of interpretation, they are inadvertently challenging traditional notions of ownership and authority. As Susan Cairns and Danny Birchall noted, ‘participative forms of curation can be taken beyond the gallery floor’ and ‘networks can enable the collaborative creation of history’. These are our citizen curators and historians. This is audience engagement and participation. This is truly, power to the people. Full conference wrap up available via Museums Computer Group. Many of the discoveries made on Flickr Commons became the subject of an exhibition – #HoodsHarbour.